Our Junior Suites double are on the third floor of the Locanda thus offering a beautiful panoramic view of Corso Vannucci or Perugia’s valley. They are perfect for couples who wants to enjoy a pleasant view from the comfort of their room. They reach up to 22sqm and are thus very comfortable for longer stays. 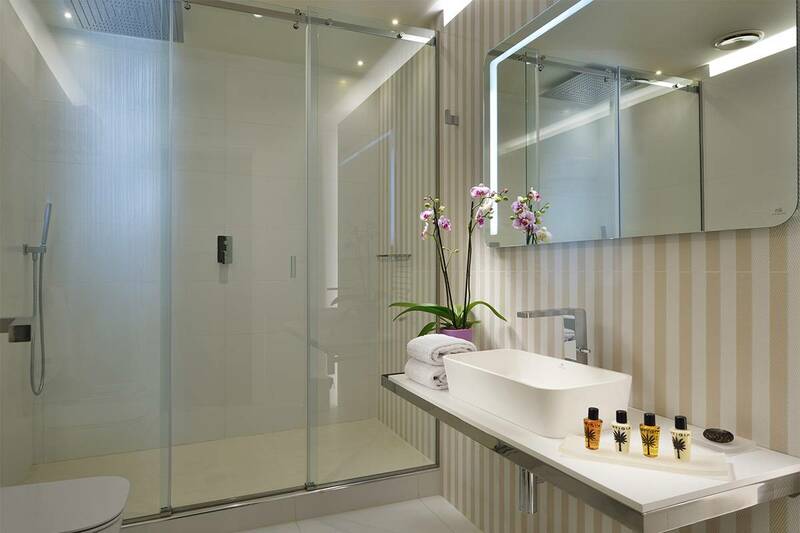 Spacious rain showers, modern design and comfort are waiting for you in these rooms! Our Family Junior Suites are on the third floor of the Locanda thus offering a beautiful panoramic view of Corso Vannucci or Perugia’s rooftops. They are perfect for couples but can accommodate families of 3 or 4 people. 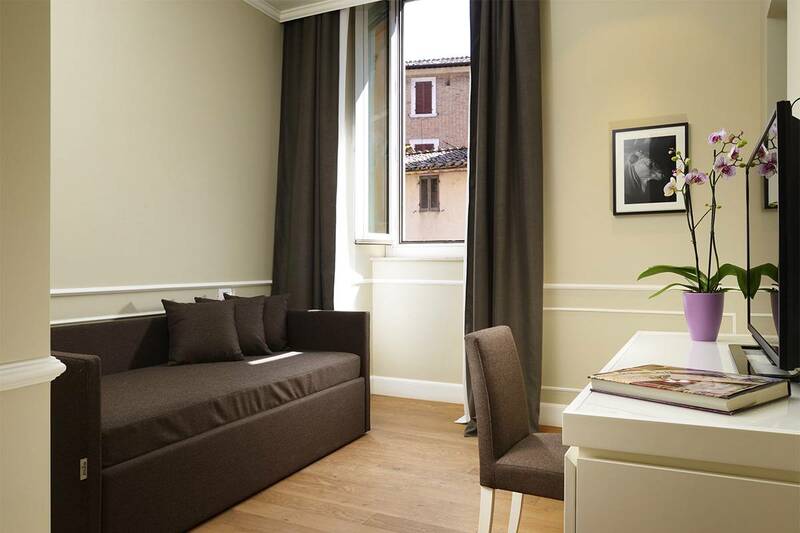 This type of rooms can reach up to 24sqm and are thus very comfortable for longer stays. Spacious rain showers, modern design and comfort are waiting for you and your loved ones! On the fourth floor of the Hotel, our Queen room has unique amenities. 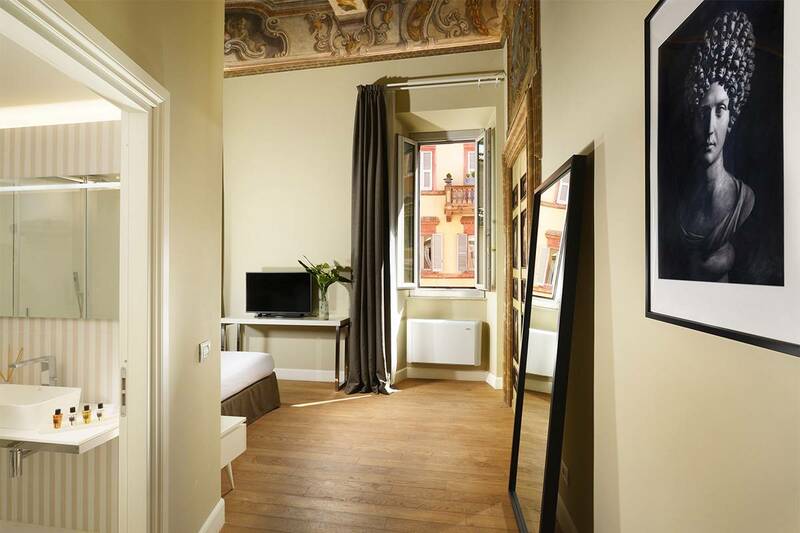 Alongside the newly-decorated room, an ample balcony overlooking Corso Vannucci and Perugia’s rooftops completes the picture. Outside, on your private balcony, a Jacuzzi City Spa allows our guests to enjoy a breathtaking view, cuddled up in its warmth. This room is not suitable for families with children under 14 years of age but it is an excellent choice for couples that wish to experience privacy and relax in the city centre. If booked with the only other room on the fourth floor, the Deluxe Room with Jacuzzi Frame, it becomes the exclusive Jacuzzi SPA Suite: two rooms, two balconies, a private floor and the comfort that only Jacuzzi can provide! The Deluxe Room is on the fourth floor of the Hotel and it has a private balcony overlooking Corso Vannucci and Perugia’s outskirts. The Deluxe Room is provided with the multifunctional shower Jacuzzi Frame with cycles of chromotherapy, Turkish baths, hydromassages and many more functions for you to try. This room is not suitable for families with children under 14 years of age but it is an excellent choice for couples that wish to experience privacy and relax in the city centre. If booked with the only other room on the fourth floor, the Queen Room with Jacuzzi City Spa, it becomes the exclusive Jacuzzi SPA Suite: two rooms, two balconies, a private floor and the comfort that only Jacuzzi can provide! The Superior Rooms and mostly located on the first floor. There rooms are 21sqm and can easily accommodate couples for longer stays. For the most part the view of these rooms is of our inner courtyards thus offering quiet and peacefulness in the noise of a city centre. The Standard Rooms can be found for the most part on the first floor of the Hotel, facing our inner courtyards. They are peaceful and calm rooms, a haven of rest in the city centre. With their 20sqm they are suitable for couples that prefer medium stays. This type of rooms cannot be arranged with twin beds nor can accommodate an extra bed or cot. Our smallest room facing the palace’s inner courtyards. The shower in this room is lowered making its use a bit uncomfortable for quite tall people. The small dimensions of the room prevents the arrangement of twin beds, extra beds or cots. The Economy Room is the perfect solution for single guests or couples that enjoy short city breaks at convenient prices.